John Wagner’s take-no-prisoners-cop and the forerunner to Judge Dredd is collected for the very first time! Part Dirty Harry, part Judge Dredd, all badass! 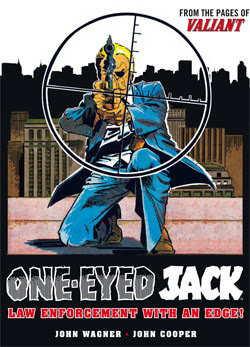 Police Detective Jack McBane is the toughest, meanest law enforcer in 1970’s New York City. Having lost his left eye in the line of duty, McBane will stop at nothing to rid the crime-infested streets of scumbags and villains – even if it means having to occasionally break the rules! This is the first collection from Rebellion’s dedicated Treasury of British Comics line, collecting lost comics from the golden age of British comics.